Join us to hear the candidates’ views on social, moral, economic and business issues. There will be an opportunity to meet and greet the Congressional candidates from 6:30-7pm, followed by the Congressional District 2 Debate from 7-9pm. The Debate will be followed immediately by a Straw Poll, conducted by our sister lobbying and advocacy organization, Florida Family Action, where each person attending the event can cast a vote for their favorite candidate. You must be eligible to vote by the Primary Election on August 30th, 2016 to participate in the Straw Poll. Please watch for a follow-up email with details regarding the Straw Ballot Poll. All 4 candidates are confirmed to attend. There is no cost to attend the Debate, however space is limited so please register in advance. Please call the Florida Family Policy Council for any questions. 407-251-5130. Free Event; Prior registration required. Please feel free to share & invite friends! You can find Debate information to share on FFPC’s Facebook, Twitter, Instagram, LinkedIn, and Google + accounts! 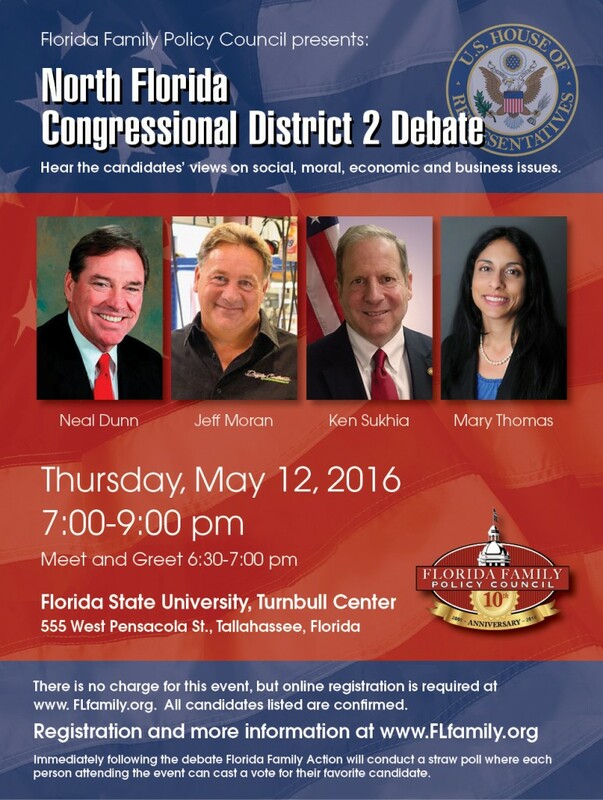 Use the Hashtag #CD2Debate on Twitter & Instagram to share with us and others your photos and thoughts on the Debate & Straw poll. Another way to get the word out is by emailing this flyer to friends and family, or downloading and printing the flyer to post around town or hand out! We’d love for you to share this exciting and educational event with as many people as possible!